I haven’t written one of these in a while because I’ve been focused on other work, but there’s plenty to discuss. How Do We Fix Spurs This Summer? First, you get a decent manager. Van Gaal is the name that’s been batted about, but there’s no reason for Spurs fans to be despondent if he doesn’t come. There are plenty of other sociopathic geniuses out there to choose from, the trick is finding the right one. Here are three: Thomas Schaaf, Thomas Tuchel, Markus Weinzierl. Yes, they are all German, but they are also all actually good at this whole managing and tactics business. Uncle Tim is not. Find Germans disagreeable? Fine. I think the best name I have heard for the Spurs job was floated as a possibility by the Telegraph this morning: Mauricio Pochettino. Better than expected offense with decent, but not great players? Check. Used to working with a Director of Football system and ownership that isn’t completely attached to reality? Also check. 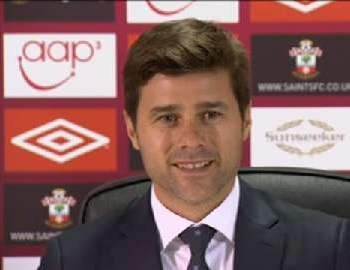 Don’t underestimate what Pochettino actually did with Southampton. Before he came along, they were definite candidates for relegation under Nigel Adkins. After he came along, they were nowhere near relegation, and have taken fairly regular scalps from big teams in the Premier League. They are a very comfortable 8th this year, even after wasting £27M on Wanyama and Pablo Osvaldo. 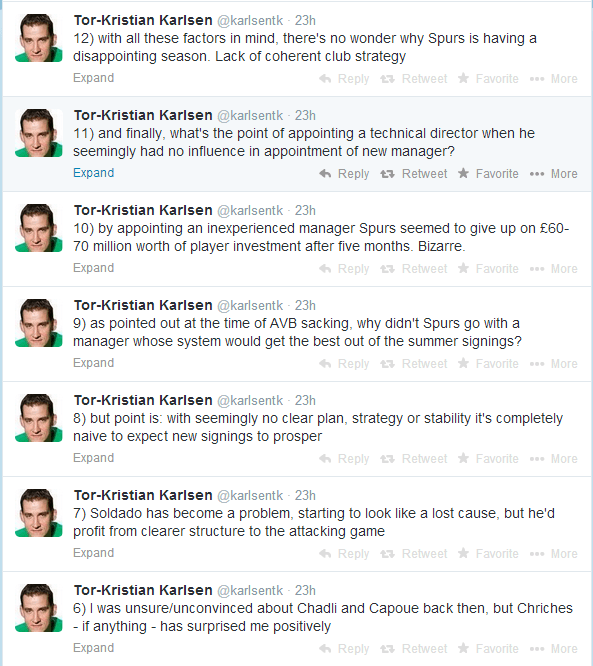 His tactical system is a lot like what AVB ran at Spurs, except Southampton players actually score when they shoot. The attacking talent is mostly there, and I still think the buys they made last summer are pretty good, but evaluating them is complicated by the fact that guidance from the top has been seriously remiss. On the other hand, there is a problem with the Spurs defense. They need 1-2 center backs this summer and have to completely re-evaluate their fullback situation. Neither Dawson nor Kaboul (who used to be outstanding) have looked capable of playing against anyone in the top half of the table. Meanwhile, Kyle Naughton, who is 25 now, doesn’t belong anywhere near the starting lineup. That leaves the oft-injured Danny Rose (decent) and Kyle Walker (good), plus The Janimal, who might actually rip the still-beating heart out of the next manager that forces him to play left back. I don’t know where Spurs will get the money to re-tool this summer, but fix the manager issue and add quality and pace to the back line and they will again be good enough to compete for Champions League places. Hell, everything kind of fell apart on them this season and they are 2 points above Manchester United in the table. All is not lost. I’m going to start by assuming you read the piece from this weekend by Ben Pugsley. If not, click over there and come back to me. I haven’t written much about Arsenal this season because I really did not want to be that downer fan standing on the side saying, “Hey guys… something’s not right here.” I just wanted to enjoy the ride and hope that they continued to over perform. 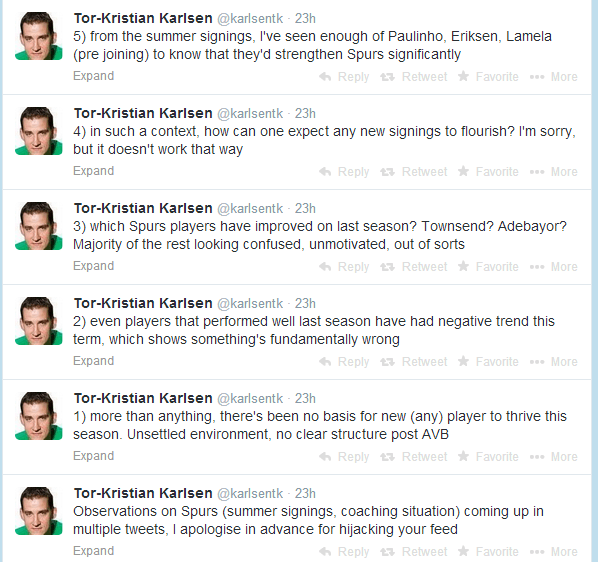 Writing about Tottenham’s self-destruction? Good fun! Writing about Liverpool’s analytical revolution and march up the table? Also good fun! Writing about how Arsenal’s baseline numbers are falling off a cliff this year? It just irritates people. This kind of needs to be said though. ARSENAL ARE TENTH IN THE LEAGUE IN SHOTS PER GAME THIS SEASON! Yes, it fails to account for shot quality for or against, but basic shots and that differential captures the broad strokes. Going from a 7.2 shot differential per game – a number that would generally compete for the top of the league – to a 1.5 over the course of five seasons is staggering. Even more staggering is that Arsenal have done it under the same manager (and are still about 80% likely to finish 4th). The first reason most Arsenal fans would point to is injuries. The problem with this theory is that Arsenal always have a lot of injuries. In fact, they are almost always near or at the top of the injury table in terms of player games missed due to injury, and this happens every season and is not just because Abou Diaby is broken. Because Arsenal always lead the injury table, I’m lead to think there is definitely a problem with regard to their fitness regime. Either they are training wrong, have the wrong expectations in terms of how much training and game time most players can endure before they are likely to pick up injuries, or they have too few players for their typical game load (in short: the squad needs to be bigger). I am not an expert in sports science and I don’t know how things operate specifically at Arsenal, but the fact that this problem is constant means they need to do something different going forward or the problem will always exist. Another major issue with Arsenal this season is quite simple: They have no zoom. Pace. Meep-meep. With Theo Walcott out, Arsenal have zero players in the attack that actually scare opposing defenders, either when running on to throughballs (an Ozil specialty) or running at defenders off the dribble. Compare that to City (Aguero, Navas, Silva) or Liverpool (Suarez, Sturridge, Sterling, Coutinho), and the differences become stark. Lack of pace means tighter marking to the players up front. It also means less space to exploit between the back line of the defense and the midfield bank of four, which makes it harder to Arsenal’s intricate passing game to operate, and means you have less space for all of those talented attacking midfielders to do their thing. It also means slower recovery speed from attack to defense, and it creates a whole host of secondary issues that aren’t entirely obvious. I actually saw the esteemed Arseblog and Orbinho discussing the quality of Arsenal’s crossing this morning, and Giroud’s ability to get on the end of them and my jaw dropped. Given how Arsenal have played in years past under Wenger, this whole crossing business should be a tertiary concern. However, because the entire squad lacks pace going forward, it suddenly matters. That’s definitely not part of the plan. So there’s no pace in the squad, the talent level in attack is a huge question mark, and multiple important players are constantly injured and have been for years. Things are very much not right at Arsenal, but they used to be. Money is no longer a problem, but maybe the correct perspective to diagnose and treat the issues is. We’ll know more next year. The theory that tackles and interceptions have no statistical correlation to goals against and the like bugs me. It’s correct – there is no correlation from either – but defense is also tremendously important. It likely means that we’re measuring the wrong stuff from games, or we haven’t figured out how to adjust the stuff that we are measuring in a way that is important. I can also tell you from my player research that having higher levels of Int and Tack in your stat sheet seems fairly significant, but at the team level? Meh. With this in mind, I started thinking about how to “fix” the base stats collected. If a team has the ball, they can’t make defensive actions. Therefore possession is a limiting factor on potential defensive actions! A team like Bayern, who has had more than twice as much possession than their opponents, has far fewer opportunities to even perform defensive actions unless they go rogue and start stealing the ball from their teammates. A breakthrough! Normalizing by possession ends up giving defensive actions the same correlation as possession itself. Which probably makes sense, but I was hoping for more. It’s entirely possible I screwed things up or missed a different way to attack this problem, so with that in mind, I have included the data set at the end of this article for all of you to play with. In the meantime, I’ll keep working on this, because I am sure defense matters… I just don’t know how to prove it yet.